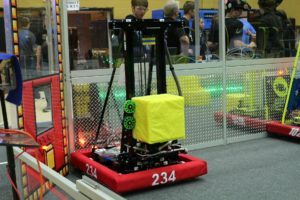 Our 2018 robot was a tall robot with a fast elevator that allowed us to move cubes efficiently and quickly across the field. The unique aspects of this game favored maneuverability over raw speed or power, and our robot did very well at events because of this. A simple design which allowed us to efficiently maneuver game pieces, a speed which allowed us to travel large distances with little downtime, and a reliable intake which resulted in fast piece placement and acquisition. Our robot had a feature which would lower our elevator if we started to tip past a certain point. This lowered our center of mass and kept the robot from falling over. Tipping over in one of our first matches at Miami Valley Regional. Ranking high at multiple events and winning the Plainfield District event.